Censorship has gone beyond print publications to electronic publications (Bora S. Kamel, Flickr, July 8, 2012). The Sudan National Assembly passed the Law on Combating Cybercrimes of 2018, referred to as the “Cybercrimes Law,” on June 10, just days before the government approved a bill amending the Media and Publications Law. More than a month after the National Assembly passed the Cybercrimes Law, which was submitted by the Ministry of Telecommunications and is based on the 2007 Cybercrimes Act, SMEX was not able to find the full text of the law on the National Assembly’s website, but some of the details of the law were published in Sudanese newspapers and online publications. The law states that online publishing on different platforms can fall under the category of “spreading fake news.” It also uses loose terms “which raised concerns especially among journalists as they restrict freedom of speech, press freedom, and online publishing,” Dr. Sami Abdelhalim Saeed, a specialist in legal reforms in Sudan, told SMEX. The Cybercrimes Law also includes articles that could be used to prevent citizens from criticizing issues involving foreigners. The law states that “anyone using the internet or any communications or information means, to incite hatred against foreigners, causing discrimination and hostility” will face a two year prison sentence. In addition, the second chapter of law passed by the General Assembly contains articles about networks and account hacking and internet shutdowns, such as hacking sites, systems, networks and communication services, penetrating information systems from a public official, in addition to interrupting, intercepting, blocking, disrupting, and tapping services. A law to regulate or control the press? SMEX also could not find a full copy of the government-approved bill that amends the Media Law, but some of the major articles can be found in Sudanese newspapers and online publications. The draft Media Law, approved by the government on June 21, created controversy before the General Assembly debated it. The new Media Law also repeats articles mentioned in other laws, such as the Media and Publication Law of 2009, the Cybercrime Act of 2007, the National Security Act of 2010, the Criminal Act of 1991, as well as the Access to Information Law of 2015. Proposing such an online publishing law is “an attempt to limit the tangible impact of social media and online journalism, and to restrict the participation of citizens in expressing their opinions,” according to Saeed. “The new amendments do not distinguish between the conventional newspaper and online personal pages [and profiles]. They define online journalism as any offline or online wall or paper that has content for sharing purposes,” he added. The Media Law amendments give authority to “Registration Committee,” Which oversees the registration of journalists. Members of the press and independent journalists are required to register to this committee, which has the power to prevent them from writing about any topic it sees as problematic. If it flags an issue as problematic, it can threaten to suspend the newspaper, and revoking the newspaper’s license without a specified period. Saeed sees the creation of the committee as the government’s attempt to exercise more online censorship. 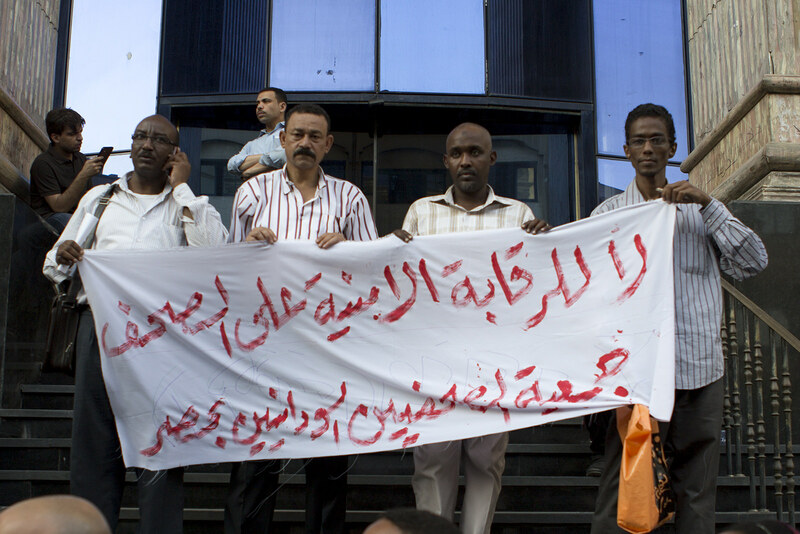 These new cybercrimes and online publishing laws in Sudan are not the first of their kind in the Arab region. Several Arab countries have adopted laws and procedures that restrict freedom of expression, such as Egypt, Syria, Bahrain, Lebanon, Saudi Arabia and other countries.